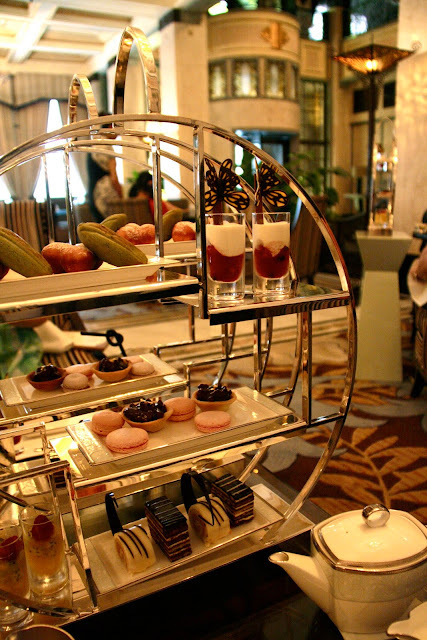 I went today to have high tea in the Jasmine Lounge of The Peace Hotel on The Bund. I should have prepped better for this high tea with a 24 hour fast beforehand - as it was I was woefully underprepared for the mountain of food that arrived, thankfully not all at once. Opera cake, strawberry macaroons, chocolate butterflies, miniature doughnuts, smoked salmon on rye, all served with good quality darjeeling tea - heavenly. Just when I thought I couldn't swallow another crumb, out came a plate of exquisite hand-made chocolates, including a green tea chocolate pyramid topped with gold leaf. The real joy of the Peace Hotel though is in the surroundings. This masterpiece of art deco decadence opened in 1929, as The Cathay Hotel. 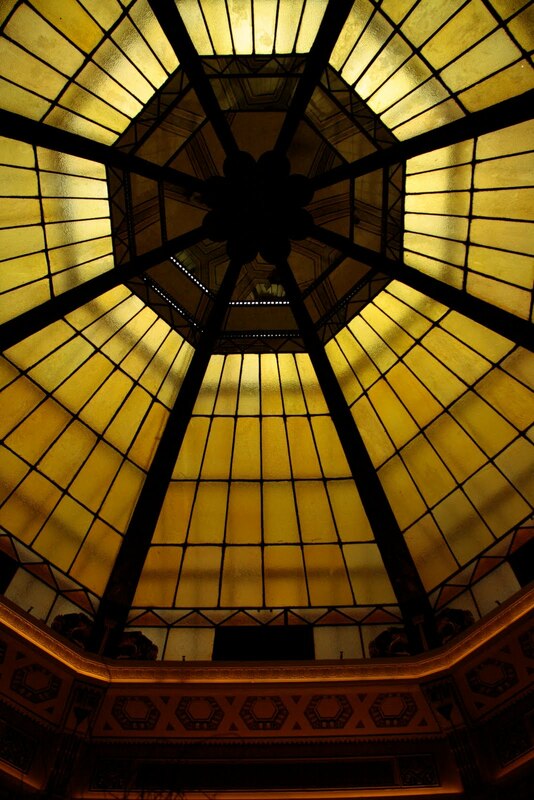 Sir Victor Sassoon, the owner, and legendary entrepreneur, spared no expense on the incredible glass atrium ceiling, the art deco light fixtures, the bars and restaurants, and the rooms. Noel Coward wrote Private Lives while holed up here and every visiting diplomat and celebrity in the thirties stayed or dined here, Charlie Chaplin included. Sitting on the corner of Shanghai's two most famous roads - Nanjing East Road and The Bund, it was the place to be seen. Sadly years of political turmoil and state ownership from 1949 eroded and divided its beautiful interior, and covered up its art deco features. The rooms became offices, the atrium hidden, the beautiful tiles painted over. Although part of the hotel re-opened in 1956 as The Peace Hotel, now it felt like a sad ghost of its former self. It's been under closed and renovation for the last three years, but as time dragged on and there was no sign of it re-opening I became apprehensive that the Chinese fervour for soul-less modernizations had taken hold here too. I shouldn't have been worried. This is a true restoration, rather than a renovation, and all the incredible original features are unveiled - the banisters, the original art deco lights and heater grilles, the revolving doors, and the beautiful tiled walls.